Plan your Christmas knits over a lazy weekend and match yarns, colours, styles and fits to all your gift list, without seeing the result gathering dust on Boxing Day! I'm ready to Start planning my Knitting! Want to plan a few knits for a change? How many times have you knitted your friends and family gifts, and seen them languishing and unworn by the boot box three months later? When you've put so much effort into a Doctor Who scarf, a Gryffindor mug cosy, and an Outlander-inspired shawl, isn't it heart-breaking to see the face fall when the carefully wrapped gift is opened? Worried the same old boring is too..... boring? Are you the sis-in-law who's knitted three grey pairs of mitts three years in a row, as 'she always wears grey'? Gift a heart-stopping 'wow' as well as the knit! With a set of step-by-step videos you're going to find ideas for this year's Christmas knits that light up the hearts of those who open gifts from you. Your nephew will hug you over and again when he sees you on Boxing Day. Just imagine gifting him a Harry Potter inspired hat at the age of nine, and he'll still be squeezing it on his head when he's off to University. That's the kind of impact you can have this year, if you watch the lessons and take the action with your knitting I know you're capable of. 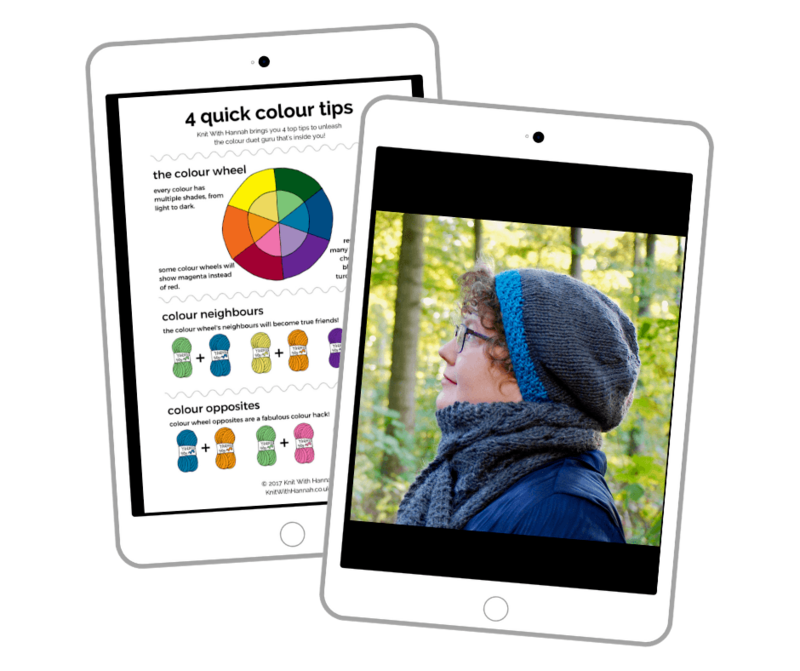 - 4 videos helping you plan your knits, so they're loved and worn for years to come. - discover how the colours you choose will make a big difference. 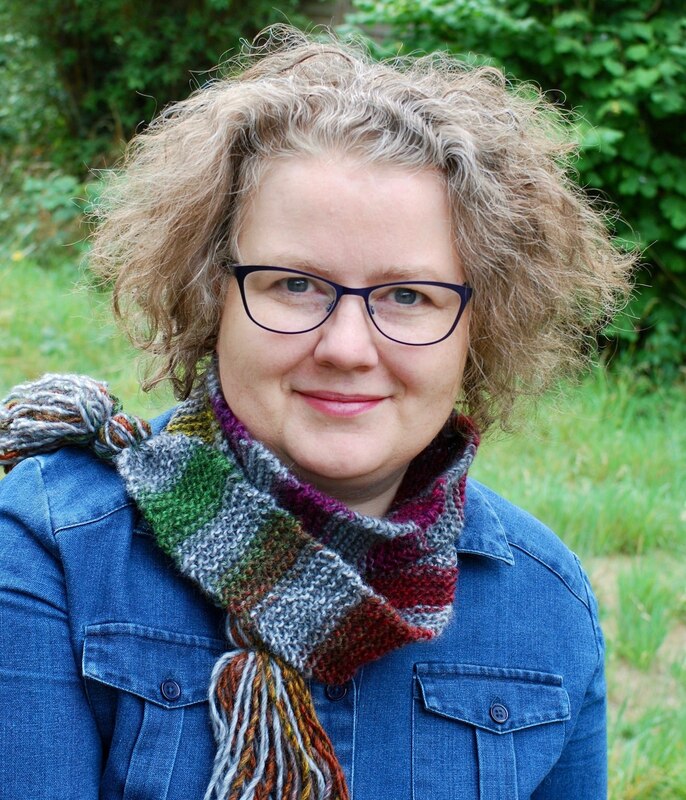 - learn some sizing tricks, so anything you knit will fit like a glove! - become a detective about which knits to choose for which recipient. - BONUS video and cheatsheet guide to help choose colours in pairs. Spend 35mins watching the videos, while you're waiting for your party dress to be delivered post-haste by FedEx, and then an afternoon in a coffee shop (or the café in your local yarn store!) 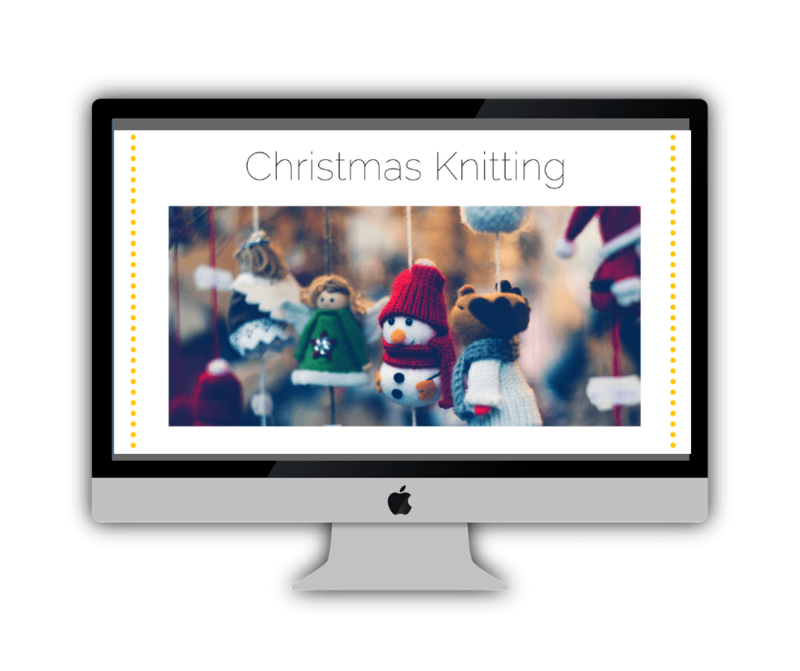 planning the yarns and patterns you'll knit for family in the run up for Christmas. Picking colours in pairs can be scary sometimes. You'll always get it right, with this cheatsheet by your side. 4 rules to follow and lots of examples for a quick reminder every time you're planning a new knit. 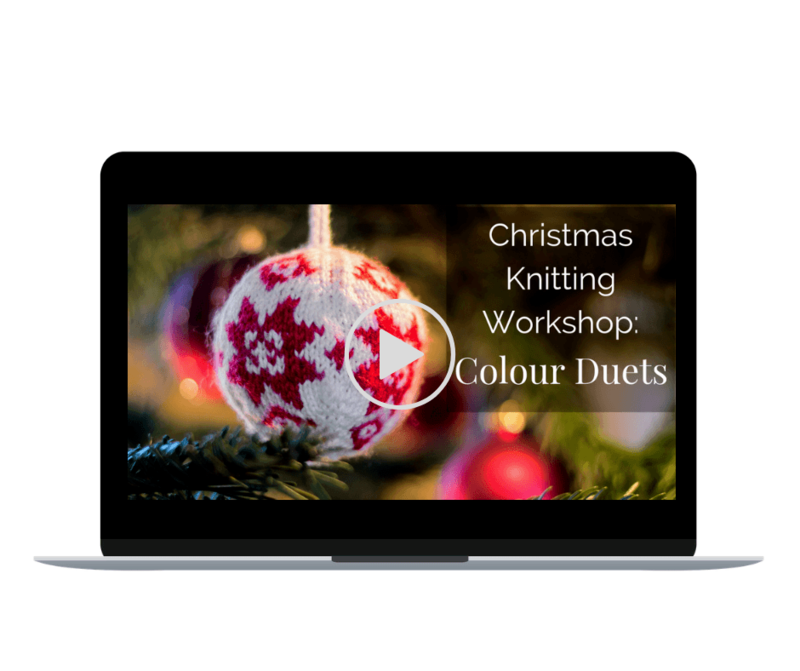 I'll help you wrap up the colour duets guide with a Christmassy twist. It's an easy fix, once you know how, to create knits that will be loved every winter for many years, thanks to the colours of yarn you choose, as well as the pattern. Are the Weekend Workshops Right For You? Four videos lasting between 7 and 10 mins, and a bonus video. Complete video time approx 35mins. Life-time access to the videos, in the password-protected members area of the Knit WIth Hannah website. WHAT'S not IN THIS WORKSHOP? I'll not teach you any knitting techniques, this workshop is all about planning for gift giving. You'll not get access to any other weekend workshop- this offer is for one workshop, teaching Christmas planning. Why learn to knit with Hannah? I've been knitting since I was yay high, (you know, the height of a four-year-old!) which is almost 4 decades. I've knitted countless items, tried and conquered so many techniques and styles of knitting, and learned a lot of what not to do too! Let's face it, I just love it. My teaching experience comes not just from teaching my friends and family to knit (I was helping my friends at school!) but also from teaching the piano in my 20s and from having a Mum who was a teacher- her style and experience rubbed off on me, so I know how to break down tasks and deliver them, so you can understand more fully and easily what you're learning. These Weekend Workshops are some of my favourite creations- I love teaching and learning in bite-sized chunks- I hope you'll love them too! Where are the videos... is it live? This is a life-time access workshop, it's not a renewable membership. Once you're in you're in! As long as I'm knitting (which is likely to be life-time!) I'm planning on having the website and courses available to you. Just email me with your request for a refund within 7 days. If you have any questions within 30 days of purchase, once you start knitting, I'll answer them if you email me Hannah@knitwithhannah.co.uk. Why should I buy this workshop instead of using Craftsy? If you use my workshops I'll help you work through one step at a time and not ask you to leap too far at once. My teaching method is all about keeping it simple which always achieves stunning results. Remember- this is a one time only fee too! I'm not a fan of the membership monthly payments, I'd rather we paid more up front so we can then use our monthly wages for other things, like flat whites and blueberry muffins! Don't Be Left Behind: Start Knitting Today!